Soft finishing foam on one side. Polishing orange foam on the other side. The Wolfgang Polish N’ Wax is a triple layered foam pad with orange light cutting foam on one side and soft, gray finishing foam on the other side. The red layer in the middle gives the pad additional height so you can grip it without rubbing your fingers on the paint. The pad is oval for comfortable gripping, and it is larger than the average applicator pad so you cover more area in less time. Use the orange side to apply polishes and swirl removers. It has enough cutting power to remove light oxidation and swirl marks while bringing out the natural luster of the paint. 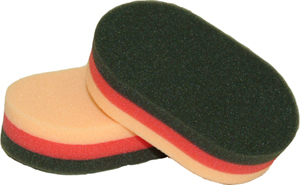 Wash the pad in a bucket of Wolfgang Polishing Pad Rejuvenator and water before switching to the gray side, just in case any polish bled through. Contains 2 Wolfgang Polish N' Wax applicators. I like the different textures on two sides of the applicator. I use the rough side with Sonus leather cleaner for my 328xi. And I use the soft side to apply Sonus leather conditioner. I bought two so I do not have to wait for the applicator to dry between cleaning and conditioning.